Last week I finished Taipei, the new novel by Tao Lin. It’s not exactly an enjoyable read, but I think it’s the best fictional representation I’ve ever seen of life right now, in 2013. The novel is filled with drugged-out wandering around cities, desperate Facebook stalking, and house parties where no one seems to like each other. The prose is bleak yet hypnotic, and though the characters are cut off from their emotion, I found the novel deeply affecting. I decided to do some simple nail art inspired by the gorgeous cover. To get this look, I applied two coats of Sinful Colors in Secret Admirer. I usually shy away from blacks, but what I liked about this shade was that it was filled with silver microglitter, so it’s more wearable than pure black. You can check out nice swatches of that shade on its own here. 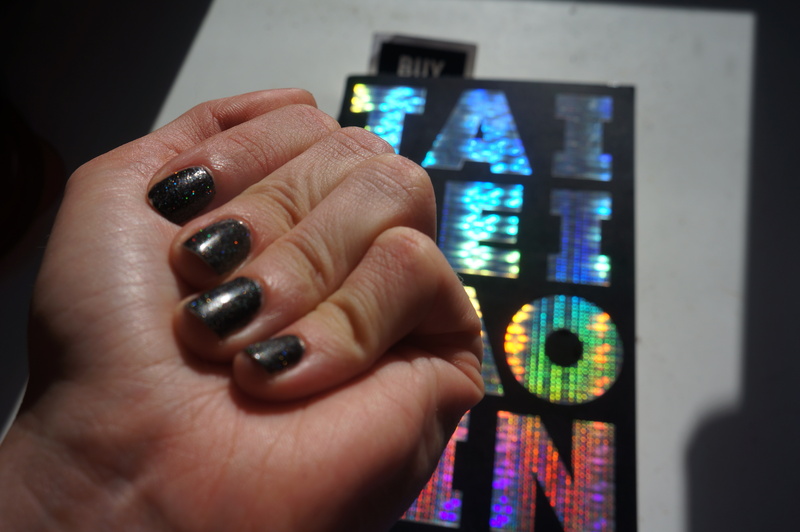 To get the holographic effect of Taipei’s cover, I added two coats of China Glaze’s Fairy Dust. It has a mix of fine prismatic glitter that looks great over dark manicures without overwhelming the base. It’s a very subtle look indoors, but like the book, it has a gorgeous rainbow effect in sunlight. Happy Pride! Celebrate the end of DOMA with double rainbows!